Photos and text by Debbie Roos, Agricultural Extension Agent. Sunny Slope Greenhouses were started in 1979 by Dave Denson and Jim LeTendre. Dave, a native of Apex, had been growing greenhouse tomatoes for four years and was looking for a new location for his operation. Jim, a native of Milwaukee, Wisconsin, was already farming and looking for a situation in which he could also raise his two kids. Sunny Slope Greenhouses is now in its 26th year on Jim’s farm, with Dave and Jim having a combined 56 years of tomato growing experience. They also sell at the greenhouses Monday through Saturday (March-July) from 8:00 a.m. ’til dark. Sunny Slope tomatoes are pesticide-free. Dave and Jim started using biological controls and innovative cultural practices in 1980, which was quite avant-garde in the U.S. greenhouse industry at that time. Some organically approved pesticides were also used in the early 1980s. 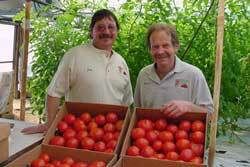 Since 1985 no pesticides – organic or otherwise – have been used to grow Sunny Slope tomatoes. Sunny Slope has served as a model for many greenhouse vegetable producers in North Carolina to be pesticide-free. Jim and Dave believe that the things that set Sunny Slope tomatoes apart from most other tomatoes are their great taste and exceptional shelf life, which exceeds 14 days in the bag or on the counter. Sunny Slope tomatoes have never been and should never be refrigerated. The great taste comes from proper nutrition and handling and the fact that they are soil-grown in the rich mineral soils of Chatham County. Take a virtual farm tour of Sunny Slope!